News just in from Alev Karagulle at Burgess that the 44.2m Hemisphere, the yachting world’s most eagerly awaited sailing catamaran, has commenced sea trials in the UK. 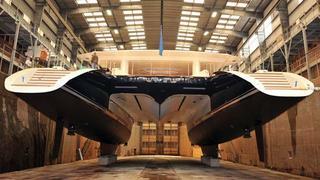 Delivery from Pendennis Shipyard is set for late July. With a length overall of 44.2m and a gross tonnage of just under 500, Hemisphere will scoop the record as the world's largest luxury sailing catamaran. The yacht will join Pendennis’ impressive roster of over 30 new build projects, completed in their extensive 150m long covered dry dock facility. With over 20 years of combined refit and new build experience, Pendennis has partnered with leading multihull naval architects Van Peteghem Lauriot Prévost (VPLP) – designers of the 33rd America’s Cup winning multihull – and the obvious choice to offer their unique experience to such a specialised project. Celebrated superyacht interior designers Michael Leach Design and the entire team behind the build have pooled their respective talents and expertise to accomplish the execution of this groundbreaking vessel. The result is an innovative design brimming with creatively practical features that blend speed and stability with both space and style to encompass the pure essence of innovation in the multihull market. Destined for the luxury charter market in tropical climates, Hemisphere boasts a spacious flybridge with jacuzzi, sunpads and shaded dining along with a vast indoor/outdoor living area on the main deck. Michael Leach Design’s relaxed, elegant interior is the epitome of contemporary chic and the yacht’s exceptional volume offers a high degree of luxury without a trace of glitz. Dark wood floors are offset by a soothing neutral colour palette with innumerable customised touches such as seventeen different types of granite and sixteen leather finishes, creating an ‘island living meets deluxe Pacific Rim ambience’. Accommodation for 12 guests is arranged in five comfortable en-suite cabins and the yacht will operate with a professional crew of eight. Hemisphere’s inaugural season this summer will be enjoyed by her owners in the Mediterranean. Burgess has been appointed to manage the yacht’s charter programme which will commence this winter in the Caribbean with charter rates starting at €175,000 per week. Following this, she will transit the Panama Canal into the South Pacific for summer 2012.